His button eyes came to life. They didn’t blink or flutter as they looked at the dark meadow. They couldn’t. They were polished buttons sown to a cloth head. They could only gaze at the bright full moon and the twinkling lights of the infinite starry night. “How?” He asked the stars. They didn’t answer. He looked above and saw a dark green canopy of drooping leaves. They slowly swayed. His polished button eyes watched their gentle rhythm. Carved into the trunk far above him was a heart. He leaned back and bumped his soft, cloth head against the coarse bark of the willow tree. “Ouch,” he squeaked at the willow tree although it didn’t hurt much. He lifted his small cloth arm to rub the back of his head, , instead caught it on a large, fabric ear. His ears were too large to stand on their own. When he touched them, they came to life too, and he heard crickets chirping, frogs calling and the wind rustling through tall grass. “Wow,” he said to the crickets and the frogs and the wind. He twitched his fluffy nose at the sounds and it also came to life. He smelled the dewy grass and the faint blossoms. His polished button eyes scanned the meadow to match sight and smell. His stitched mouth curled to smile. He then sensed a new smell. It smelled like fur and dirt, but he couldn’t find it. “What is this?” He asked the phantom smell. It didn’t answer. His cloth legs stirred and he stood. His limbs wobbled. They were almost too small to lift his round cloth body. As he stammered a thistle caught onto his yarn tail. “Stop it,” he said to the thistle. He grabbed his yarn tail to fling the thistle away, but it was latched tight. He pawed it only to catch it on his cloth arm. He pawed at it with his other arm, but it only got caught again. It clung to his ears, limbs and nose until it became loosely fastened to his purple bowtie and finally rolled to the ground. He looked at the thistle. 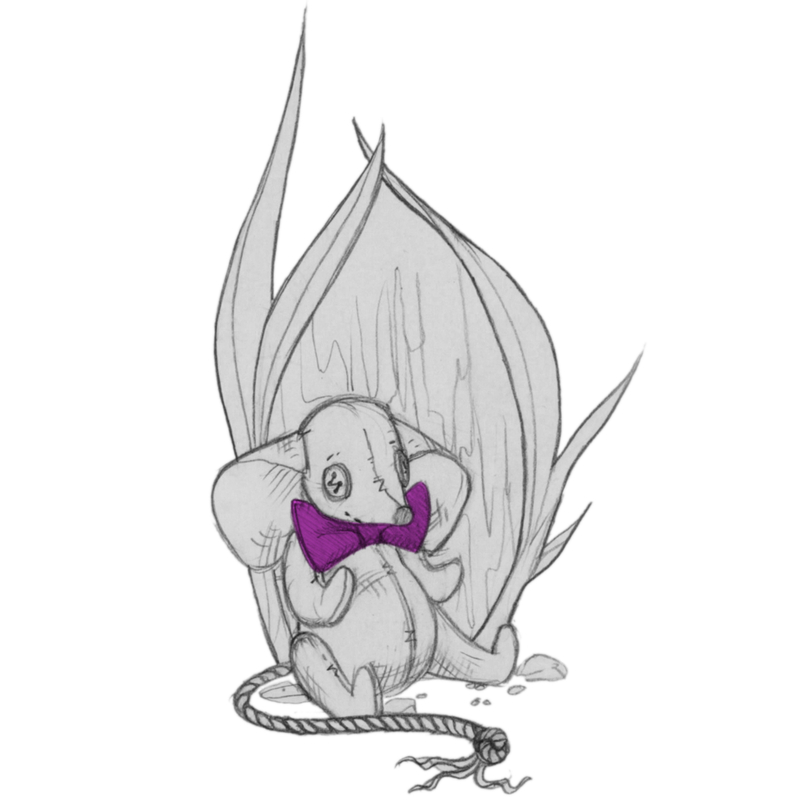 “Oh, how pleasant,” he said to his purple bowtie and walked into the tall grass. He found a lake and its water was dark and still. He stopped at its edge to look at his reflection. He was a little mouse doll, larger than a child’s hand, but small enough to fit in a child’s pocket. “Why?” He asked the lake. It didn’t answer. He must’ve stared at his reflection for a long time, for the moon slowly drifted across the sky. The little mouse doll didn’t think about anything in particular, only the thought of being able to think at all, and what it meant, if anything, that he could. He was interrupted by a low growl and the smell of fur and dirt. He turned and saw a tabby cat. The cat was crouched, his pale eyes squinted at the doll, and a blue scarf was tied around his neck. “Hello,” the doll said. The tabby cat with the blue scarf pounced. Novel: Willow Tree’s Gift, Available End of July!